As a fitting end to 3 days of high-paced, bar-to-bar racing, the final stage of Moab Rocks was determined on the final climb of stage 3. After a gusting wind battered racers yesterday Monday’s weather couldn’t have been better. Warm temperatures and sunny skies greeted riders and no wind could be felt. The great conditions meant the riders would have only each other to battle on today’s 30-mile final stage through the Magnificent 7 trail system. The highlight of the final day was a showdown looming between former national champions: Travis Brown (Trek) for the Americans and Eric Tourville (Hype) representing the Canadians. Each rider had won a stage and just 30 seconds separated the two at the start, with Brown being the overnight race leader. The Canadians had a clear plan that started off with a suicide attack by Patrick Chartrand (Rocky Mountain) as soon as the start gun fired. Chartrand buried his head and powered away getting a 30 second lead before starting the first climb. The Rocky Mountain rider was a threat to take first on GC if his lead continued to build. That meant Travis Brown had to do all the work of chasing Chartrand and protecting his race lead. Brown did his job bringing Chartrand back with Tourville close behind. After making contact with the lead duo Tourville attacked again and again. “I attacked Travis about 20 times today. He was really impressive. Each time I went he was able to catch back up,” Tourville said after the race. The group of three shredded the 9-mile descent wheel to wheel and entered the finishing climb together. So close that Brown and Tourville registered the exact same time for the enduro segment. 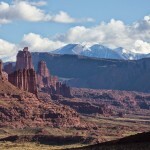 After 3 days and almost 100 miles of racing the 2014 Moab Rocks title would be decided on the very last climb of the race. Just miles from the finish line. The trio began the final climb together but Brown made it immediately clear that he had the legs to finish off his day in first place and maintain first overall in the GC. Tourville powered his way in for second followed by Chartrand. Those three took the top spots in the final stage race results. Peter Watson (Balance Point) finished fourth followed by Jonathon Firth (Planet Foods/Honey Stinger). The women’s race became a battle between two race leaders and a challenger looking for a stage win. Overnight open women’s GC leader Jen Hanks (Epic Brewing/MTBRaceNews.com) took the lead on the first climb out of the Gemini Bridges parking lot and was joined shortly after by 40+ leader Margie Smith (Wilson) and yesterday’s top challenger Pepper Harlton (Devon). Harlton was determined to make up for a weekend of bad luck by taking a stage win at Magnificent 7. The three riders stayed together throughout the first half of the race climbing the rock-strewn trails in unison. Right around the midway point the racecourse plunged down a steep Jeep trail littered with blind drop offs. The two Canadians, Smith and Harlton, fearlessly charged the treacherous trail opening an immediately opening a sizable gap to Hanks. The enduro segment downhill was next and the two leaders pushed the limits demonstrating their mastery of rough trails. That’s when bad luck struck Harlton for the third consecutive day. This time coming in the form of a flat tire for the Canadian cyclocross phenom. The flat allowed Hanks to rejoin Harlton and the two played cat and mouse on the final road section approaching the base of the final climb. Hanks put in an acceleration on the early slopes of the climb. When she looked back a small gap had opened and the Epic Brewing rider went into full attack mode sensing a stage win in hand. 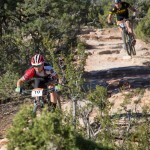 The final push to the line would prove anti-climactic as Pepper Harlton flatted again on the final descent and Hanks cruised home with stage win and open women’s title in hand. Riders congregated at the finish reliving their stories of a fantastic three days of racing in one of the most challenging and majestic race venues in the United States. The final awards ceremony was held, as it was every night, in Swanny City Park with great prizes, a slide show of the day’s race, and free beer provided by Moab Brewery. 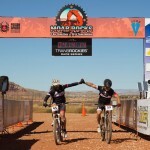 This entry was posted in Blogs, Coaching Column, Enduro, MST Time Zone by mackyfranklin. Bookmark the permalink.